Reporters are eligible to compete once a school’s mock trial team qualifies for state. Jacobs said she took as many notes as possible and documented the entire trial, then wrote a report on it. The objective of the reporting portion was to produce the most unbiased report on the given case within two hours. “In careers like the law, the most important asset you have is your ability to communicate and articulate what you have seen and to be an officer of the court, to bring the court an objective summary of what’s occurred,” Kratina said. Bellevue West High School student Taegan Jacobs approached her school’s Mock Trial coach to ask about writing a student news story on the team’s upcoming participation in the Nebraska High School Mock Trial finals. Coach Robin Katrina replied, suggesting that Jacobs enter a newly created student news reporter competition. 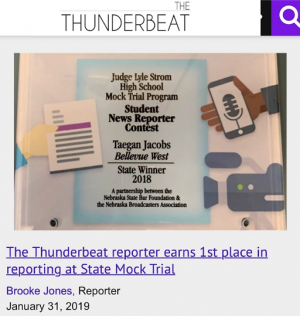 The following week Jacobs was named the winner of Nebraska’s inaugural Student Mock Trial News Reporter Contest. Jacobs is a junior at Bellevue West and is the features editor of The Thunderbeat, the school’s student news site. Working on the school’s news team is a good fit, she said, because she likes being involved, likes to know what is going on in school and loves to write. She said she took as many notes as possible during the trial to rely on when writing her news story. Nebraska’s first-in-the-nation Mock Trial News Reporter Contest emerged as part of the Judge Lyle Strom High School Mock Trial Program’s State Championship, which was Dec. 3-4, 2018, in Omaha. Three students from schools in Omaha, Bellevue and McCook took part in the first year of the news writing competition. Organizers expect many more students to enter in 2019 as the contest becomes better known and gains support among students, educators and news media professionals. The program is the brainchild of the Nebraska State Bar Foundation (NSBF) and the Nebraska Broadcasters Association (NBA). Executive Directors Doris Huffman, NSBF, and Jim Timm, NBA, developed the idea through their work together on Nebraska’s Bench Media Committee. “We intentionally started small this year, but, as with all Mock Trial activities, the plan is to go big,” said Huffman. She said expansion of the Mock Trial Program to include a news reporting component is a natural progression and eventually will expand into a fully recognized school activity that will involve more students in the Mock Trial experience. “The PEOPLE Committee (of the Nebraska State Bar Foundation) is already thinking about the 2019 Student News Reporter Contest and ways to enhance this educational opportunity to include more Nebraska students. We are pleased with the inaugural contest and will be expanding next year,” said U. S. District Court Chief Judge John Gerrard . Judge Gerrard is Chair of the Bar Foundation’s Law-Related Education Committee and a member of the Bench Media Committee. The Student News Reporter Contest is viewed as an educational component of the state finals and will be a permanent feature of Nebraska’s Judge Lyle Strom High School Mock Trial Program in future years. The goal is to teach high school students who are interested in careers in journalism about the legal system. In the first year of the competition, student reporters watched their school teams compete in the morning round of the state finals and later met with mentors in the media and legal field. After the mentoring session, the student reporters composed articles about the first-round trial on their own laptops. Students were given two hours to complete the assignment. This year’s students were mentored by journalists Rose Ann Shannon, retired News Director at KETV in Omaha, and Bill Kelly, Senior Producer at NET News. Nebraska Court of Appeals Judge Francie Riedmann also mentored the students. Students asked mentors questions about writing stories relating to the court system. One of the grading points of the competition was writing a good lead, and many questions centered on the ways to start a news story. “If you don’t get that lead, it can bog you down for the entire story process,” Shannon told the students. Kelly offered three approaches when writing about courts. He recommended using an attention-getting quote He emphasized the importance of fairness and taking care to represent both sides equally. A second option he suggested was to distill a key question that a juror or judge might have to answer. In the 2018 Mock Trial case, the question might have been, “Is this person a drug dealer or not?” A third option was to condense the courtroom experience into a mini-novel or short story. Judge Riedmann asked students what they knew about the case before watching the competition. Answers ranged from “everything” to “I talked to the team a little bit before I came to the competition.” One student reporter had heard opening and closing statements in her government class, prompting a discussion on fairness. “You get a biased view from the opening statements, but that is probably where you get your best big picture story,” Judge Riedmann said. She added that it is hard to follow a case by just listening to witnesses and trying to piece together their statements. 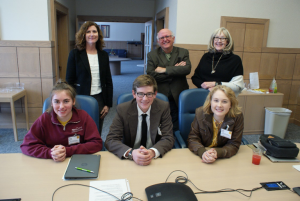 Both the High School Mock Trial Program and Student News Reporter Contest fall under the umbrella of the Nebraska State Bar Foundation’s Public Education Outreach Promoting the Law & Equity (PEOPLE) Committee. 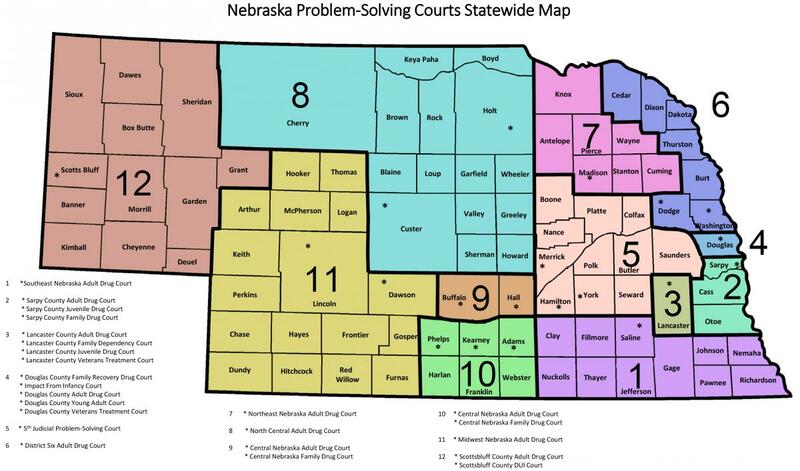 The Nebraska State Bar Foundation has been designated as the Nebraska State Center for Law-Related Education for the Public by the Office of Juvenile Justice and Delinquency Prevention in the U.S. Department of Justice. Photo: Writing advisors (back): Nebraska Court of Appeals Judge Francie Riedmann; Bill Kelly, Senior Producer NET News; Rose Ann Shannon, retired News Director KETV Student reporters (front): Madeline Mollner, Scutt Catholic; Ethan Graff, McCook; Taegan Jacobs, Bellevue West.